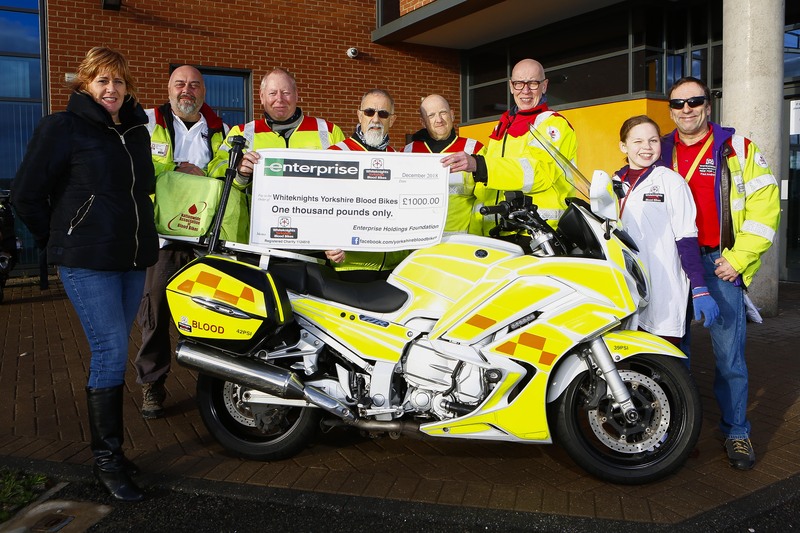 Whiteknights Yorkshire Blood Bikes are delighted to announce receiving a donation from the charitable foundation of the employer of one of our advanced-qualified volunteer riders. Peter Lenthall successfully achieved a funding award from his employer Enterprise Rent-A-Car and their charity – Enterprise Holdings Foundation. Speaking at a recent cheque presentation at Sheffield’s Northern General Hospital, South Yorkshire Regional Manager for Whiteknights Yorkshire Blood Bikes, Debbie Fulton said: “Christmas has certainly come early for Whiteknights this year! We have received a tremendous grant of one thousand pounds from Enterprise. “As we go into the New Year we are also now recruiting volunteers again. Pictured outside the Laboratory Medicine department at Northern General Hospital are the South Yorkshire volunteer riders of Whiteknights Yorkshire Blood Bikes.